Washington, Nebraska, Louisiana, Maine, and even the Virgin Islands (carrying with them all of 3 delegates), and all by healthy margins. And he beats out Bill Clinton for a Grammy! In my lifetime, I've never known so many of my peers to attend a caucus as did this past weekend up in Washington. It's proof of the transformative power of Obama that he has aroused my generation's political hopes. 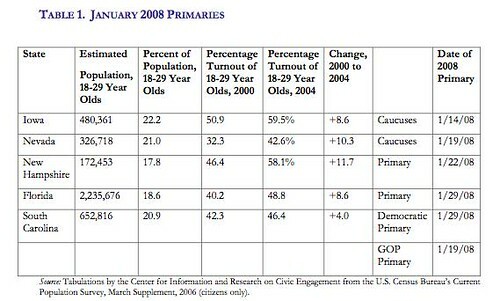 I may be hasty in assigning so much credit to Obama for galvanizing the youth vote, but whatever is happening, the number of 18-29 year olds turning out for primaries and caucuses is up significantly over 2000. In the process, perhaps we're seeing a weakening of the so-called political establishment. It certainly feels that way when you see Obama out-fundraising Clinton by collecting small amounts from many donors, rather than large amounts from fewer but thicker wallets (some enclosed in serious baggage). It feels that way when you see that Obama has won nearly every caucus state, where passionate supporters are critical. Let's hope it's a movement that isn't derailed by the peculiar Democratic Party subspecies known as superdelegates. Some day, instead of an exit poll saying that X percent of people listed health care as the number on issue, I would like to see an exit poll saying that Y percent of people were able to correctly identify correctly the differences between the candidates' proposals on health care. I think that Y would be less than 5 percent. If the United States had a multi-party parliamentary system with proportional representation, our patchwork of prejudices would likely yield a government comparable to Italy's. Clinton would make a very capable President, of that I have little doubt. And I almost certainly believe she suffers from some prejudice against women, which is unfortunate, just as Obama's skin color is an obstacle for many voters. But the chance to move past partisan politics is so potent a possibility, and it's one that I only envision with Obama. Even though Clinton-hate is less about Bill and Hillary than about those who feel it in their heart of hearts, the net effect is the same; a return to that disillusioning and toxic mood of politics in the mid nineties. Ken and I wondered if Obama would be the first black candidate to be elected head of a country in which blacks were not a majority of the population. Does anyone know? If so, it adds to what would already be a historic victory. I wonder how possible a Clinton-Obama ticket would be. Such a pairing would be unbeatable. For the good of the party? Doubtful now given how many blows they've dealt each other in the ring. Ken read somewhere that if Clinton won, she'd neutralize Obama by nominating him for the Supreme Court. That made me laugh.